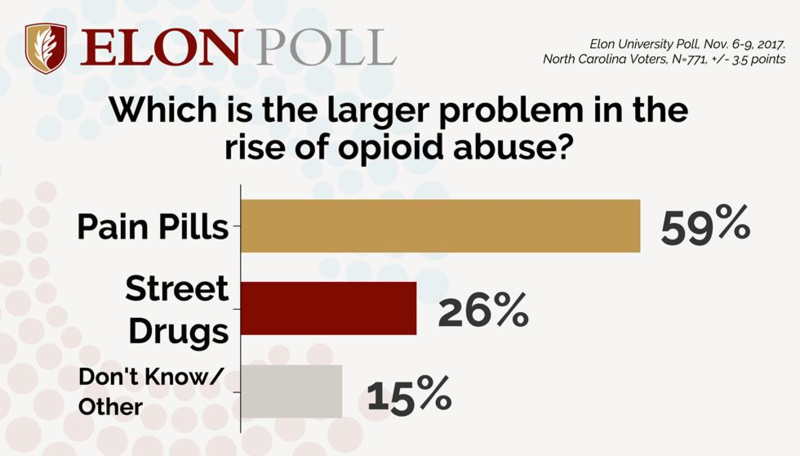 If you’ve followed NC Policy Watch’s ongoing coverage of the opioid epidemic and the state’s reaction to it, you’ll want to check out the results of the latest Elon University Poll. 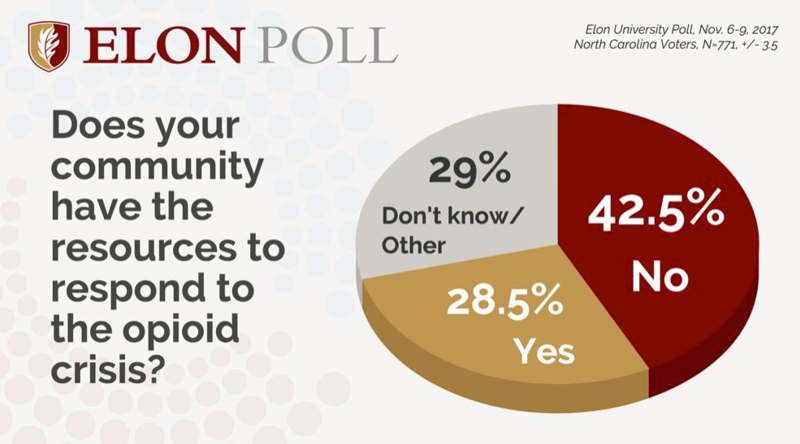 Among its findings: about one in three North Carolinians surveyed have been personally affected by opioid dependence or has a close relationship with someone who has. Perhaps unsurprisingly, most of those polled viewed prescription drugs as more of a problem than illicit street drugs like heroin. That lines up with the opinions of experts who study the problem. Most respondents also believe their community does not have the proper resources to deal with the problem. That shouldn’t come as a shock to those who have been following the state response to the problem. The state budget passed over the summer improved funding for the state’s Controlled Substances Reporting System and funneled $10 million in federal grants to treatment services. But it was well under what the governor called for in his suggested budget and only about half of what was called for in the bi-partisan Strengthen Opioid Misuse Prevention (STOP) Act. A small pilot program to treat opiate overdoses was funded in Wilmington, one of the worst places in the country for opioid abuse. What may be a surprise is the divide over how best to handle the problem. Political party affiliation produced little variation in the responses across many of the questions related to the opioid crisis in this survey, but not when it comes to opinions about the best way to address the issue — the criminal justice system vs. the health care system. Overall, 56 percent of respondents said the health care system is the best way to deal with the problem, with 61 percent of Democrats and 57 percent of independents holding that view compared to 48 percent of Republicans. As for favoring the criminal justice system, 31 percent of Republicans held that view compared to 18 percent of Democrats and 18 percent of independents. Overall, 21 percent favored the criminal justice system. 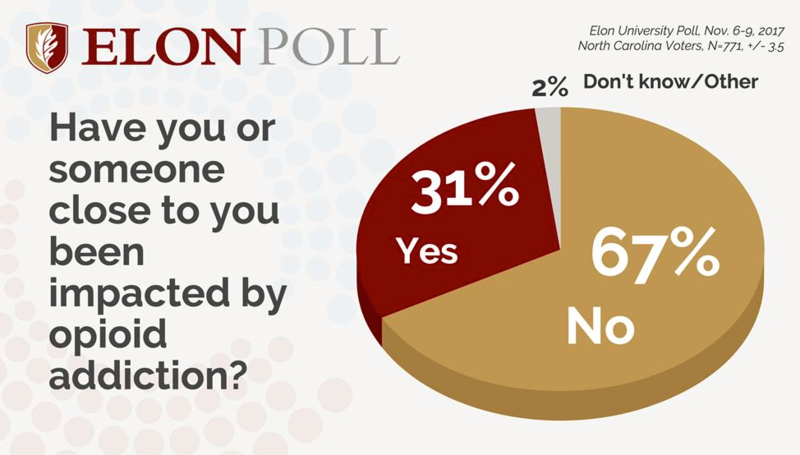 The poll – a live-caller, dual-frame (landline and cell phone) survey of 771 registered voters in North Carolina – was conducted Nov. 6-9 and has a margin of error +/-3.5 percent. Proposed tax cut bill in Congress would help 3.7 million in N.C.
Signup or login to Twitter to get even more breaking news from NCPW!